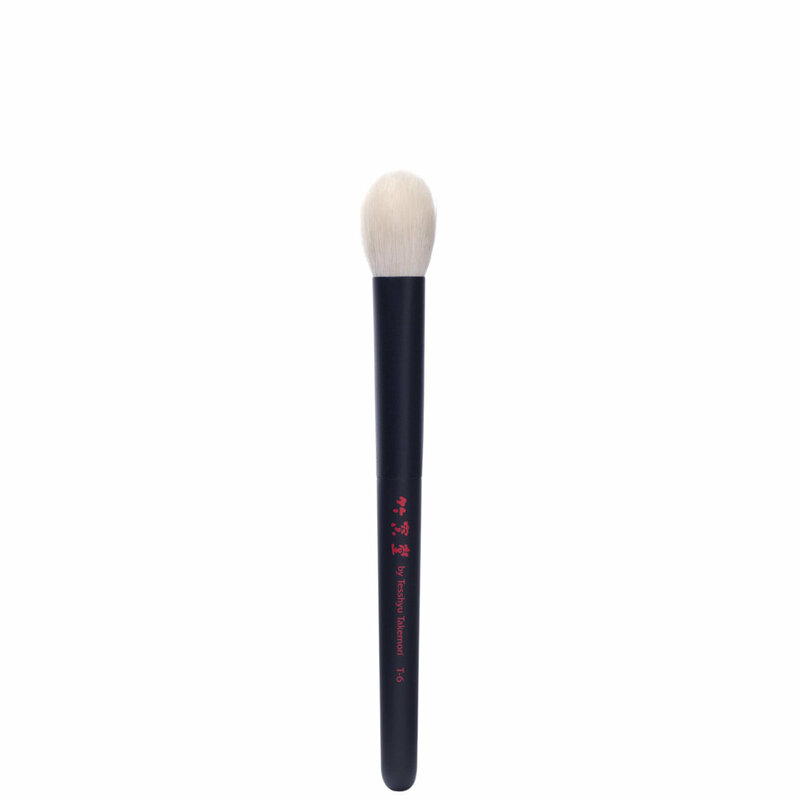 The Takumi Series T-6 is a large eye shadow brush with bristles made from the exquisitely soft hair of the Saikoho goat. Gently dip into shadows and sweep over all over lid and use buffing motion to blend focusing on the crease area. I am a brush addict (and a makeup artist) and have collected quality brushes over the years. Recently I decided to finally try a few brushes from Chikuhodo and ordered 4 brushes. I could not believe how quickly the item arrived, almost within two days. In my experience, usually other companies take about 3 to 5 business days before they ship the item to you but beautylish shipped it promptly, and it was well packaged. Now about the brush itself, it is no doubt one of my most prized possessions, and it is sitting with the other brushes of this collection in a special makeup brush bag. It is extremely soft and a pleasure to use. I will be collecting the remaining brushes in this collection. I recommend it highly. It can be used not only to blend your eyeshadow but also as a highlighter brush. I paid full price for this brush and another thing I want to mention is that the price of these takumi brushes are a few dollars higher than on visageusa website. The one reason I got them from beautylish is that they have them in stock, whereas if I ordered with visageusa, they will place an order with the manufacturer in Japan and then you will be waiting 2 weeks or so to get it directly from Japan but you would save like $5 dollars on each brush more or less. I purchased this brush after reading some rave reviews on using it as a highlighter brush and oh my! I even use this to apply/blend concealer under my eyes, this totally shoves the MAC 217 brush that I used to use for that handy task right off its spot. This brush blends any product like a dream, it's unreal. I also apply a concealer one shade lighter than my foundation on the highpoints of my face and this blends it out beautifully. It's a must have, I have not actually used it to blend out eyeshadow yet but I soon will and if it does a wonderful job I'll purchase a second one for my eyes. I truly did not expect it to be so versatile! I've gone to the dark side. Once you cross this road you will not go back. I started investing in high quality brushes and I'm hooked. I can't touch any of my old MAC brushes. This brush is seriously the softest ever. It's like silk on your eyelids. It's big, but I needed a big brush like this and it's perfect for applying eye shadow to the lid. It's so luxurious. I also have their powder brush that I also love. It's a very unusual eye brush due to its size, it's bigger than most eye brushes out there, but it's very soft, perfect for blending eyeshadow or cleaning around the eye area. Most of the time, I just apply one single eyeshadow all over my lids wear it with an eyeliner and this is my go-to brush for that purpose - it makes my eyeshadow look well-blended and flawless. I bought a number of these eye brushes and simply live them. They are soft as a baby's bottom and pick and deposit product beautifully. The perfect blending tool. My only downside (and it's so minor it's almost not worth mentioning) is that the handles are a bit short, I personally prefer to work with longer handle brushes. Other than this they are a beautiful brush and definitely worth the investment. Buying from Beautylish is always a pleasure, fast delivery and that personal touch..there is none better! So soft and amazing quality. The shape is so unique I almost want to keep it for just that reason. As for an eye brush, it was a no go for me. I tried this as an all over the lid shading brush, but find the somewhat fluffy tip to not get into the inner corner with the precision I want. As for blending out harsh lines, it doesnt blow you away. I use it to highlight and contour my nose, but I have other brushes I like better for those tasks. I haven't found its niche. Versatile, soft. Perfect for setting powder under the eyes. Can also be used for applying highlighter or creating dramatic eye make-up looks with a sweep. This is my first CHIKUHODO Takumi shadow brush, and I was amazed at how soft the brush was on my face. I wouldn't consider it a shadow brush.....I think it's a bit large for that, so I use it to apply highlighter powder to my cheekbones. It is absolutely wonderful! I was hesitant to purchase a CHIKUHODO brush....you have to admit, they're a little pricey, but worth it. I recommend this brush to anyone looking for a high-quality brush, whether you're in the beauty industry or not. This brush is like gold for me! Thanks, Beautylish, for a fine product! I saw this used in a YouTube makeup tutorial and HAD to have it! I have been searching high and low for an extra-large, soft, fluffy brush for applying all-over (single) shadow, as well as setting my eye primer with powder - and this is it!! My only concern is that I'll end up having to buy all the other awesome brushes here. ;) Love this!